Russian ambassador to Thailand shares his views on a new unorthodox version of the famous ballet. “Nutcracker” in Chiang Mai! It was Friday, and I had a wonderful plan to sail along Chao-Phraya River to the ancient capital of Ayutthaya the next morning. After a brief discussion with my wife and my daughter I cancelled the trip and on Saturday we flew to Chiang Mai. I did not regret my decision. 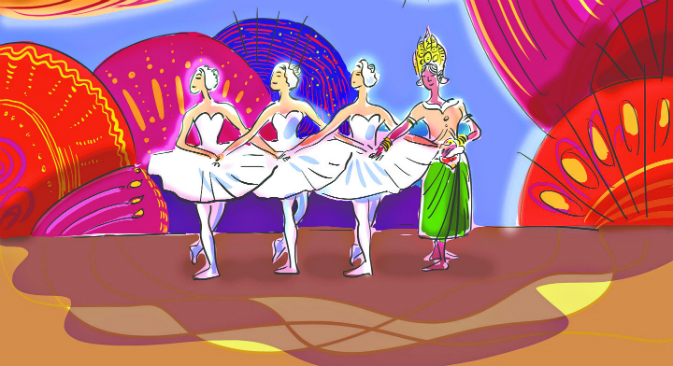 A new unorthodox version of the famous ballet was staged by Mom Luang Priyapun, director of Chiang Mai Ballet Academy and former chairwoman of Thai-Russian Parliamentary Friendship Group. Most of the dancers were little kids. It was really superb! Choreography, costumes, a mix of tradition and innovation – everything. But what impressed me most was the desire of the young artists to dance. Their strong drive and selfless devotion – some of them under six years old! - convinced me once again that true art brings people belonging to different cultures closer to each other more effectively than information and communication technologies. Why? Because music and dance penetrate one’s heart and leave their imprint for the rest of one’s life. Dancing to the beautiful melodies of Pyotr Tchaikovsky (by the way this year we are commemorating the 175th anniversary of his birth) children not only learn to understand music and ballet – they are becoming better human beings and they are definitely becoming friends of Russia. When Tchaikovsky is in their ears,Russians and Thais speak one language. Ballet is extremely popular in Thailand. It is therefore not surprising that Russian ballet teachers are in high demand here. A growing number of young Thai talents attend ballet schools opened by our compatriots – “Katyusha” in Bangkok, “Rosinka” in Pattaya and “Gusi-Lebedi” in Phuket. But exchanges are thriving on the professional level, too. Every September, the cultural life of Bangkok is overwhelmed by the Bangkok Festival of Dance and Music directed by the Russian citizen Mr JCUberoi. This year the Festival will be dedicated to celebrate the 60th birthday of Her Royal Highness Princess Maha Chakri Sirindhorn. The Thai audience love Russian dancers and are looking forward to seeing them on stage. They have very fond memories of the 2007 tour by the Mariinsky ballet company. That tour was devoted to the 80th anniversary of His Majesty King Bhumibol Adulyadej of Thailand and was an enormous success. One of the performances was attended by His Majesty the King and the Queen. It was reported that one of the dances performed there was set to music written by His Majesty, who is an accomplished composer. Expanding music and ballet contacts is perhaps one of the most promising areas in the cultural cooperation between our two countries. Which is not at all surprising: Thais’ interest in Russian classical culture and art is well known. Hardly any classical concert in Bangkok goes without performing music by Tchaikovsky or Mussorgsky, Rachmaninov or Stravinsky. This attraction between the two countries’ cultures works both ways. I have no doubt that, were they to be brought to Russia, large-scale theatrical productions of the ancient Thai epic “Ramakien” would become an enormous hit with the Russian audiences. We have a variety of cultural projects in progress. In May this year, a group of Russian artists headed by VN Anisimov, the director of the Bureau of Artistic Expeditions and a great expert in Oriental Studies, will be visiting Thailand to travel across the country and produce landscapes and portraits that will later form the basis of an exhibition and an album to be presented both in Moscow and Bangkok. Russian films in Thailand are known only among experts. However, this gap could be bridged by showing both Russian cinema masterpieces and young directors’ works at the Bangkok Film Festival, which is held in the Thai capital every November. There are interesting projects in the pipeline as part of the twin-city relations between our two capitals. This year, Moscow will be hosting a Bangkok Culture Festival, while in 2016, a Moscow Culture Festival will be held in Bangkok. It so happens that Bangkok does not yet have a Russian science and culture centre. This issue was discussed on April 8 this year, during the talks in Bangkok between Russian Prime Minister Dmitry Medvedev and his Thai counterpart Prayut Chan-o-cha. On their instruction, the two sides have started drafting an intergovernmental agreement on the establishment and operation of the Russian information and culture centre in Thailand. This agreement will significantly bolster the regulatory basis for cultural cooperation between our two countries. At the moment, this cooperation is founded on the Agreement on Cultural Cooperation between the government of the Russian Federation and the government of the Kingdom of Thailand of 2000 and on memoranda of understanding that the two countries’ culture ministries sign every three years. In 2017, Russia and Thailand will be marking the 120th anniversary since the establishment of diplomatic relations. An official start to the celebrations of this significant anniversary was given at a reception at the Thai Foreign Ministry on February 11 this year. The sides agreed to draw up and adopt a joint plan of celebrations of the 120th anniversary of diplomatic relations, whose implementation should give a significant boost to the development of Russian-Thai cultural exchanges. Kirill Barsky is Ambassador Extraordinary and Plenipotentiary of the Russian Federation to the Kingdom of Thailand.